The Maasai are semi-nomadic pastoralists with a colourful and proud cultural heritage centred on their cattle and strong communal social organization. 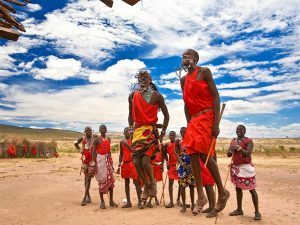 Their traditional dress, language, music and dance are all instantly and intentionally recognizable as “Maasai”. Their age-old rituals form important pillars in identity and well-being and traditional beliefs towards wildlife have further enhanced a generally peaceful and mutually beneficial co-existence between people, wildlife and the land. The common religion amongst the Maasai community is Christianity. The conservancy is a partnership between thirteen Tourism Partners and over 800 Maasai landowners. The aim is to be a world class conservancy with a long term commitment to benefit the environment, wildlife and community livelihoods through a strong tourism partnership. The Landowner Committee reports to all landowners for their final approval. Twice a year, full community meetings are held whereby all landowners are able to voice their opinion on the way forward. MNC realizes that the economic development and prosperity of landowners and local communities is inextricably linked to the conservancy’s ultimate success. MNC’s member camps have set up numerous projects, which highly benefit the local communities. They have established educational as well as health facilities with a focus on maternal and child disease, HIV/Aids, TB, malaria and waterborne diseases. Several member camps are also supporting women’s empowerment enterprises, including the development of new income-generating activities, such as handicraft projects. Communities living in natural wildlife areas must be provided with the economic incentives to set aside their land for wildlife conservation. In the 1980s & 1990s, growing land fragmentation began to lead to the environmental degradation of the Maasai Mara ecosystem and exacerbated community impoverishment. Without a partnership between Maasai landowners and the private tourism sector it was difficult to ensure sustainable, well coordinated and effective wildlife protection along with recognizable benefits for all stakeholders. In 2008 the founding members of MNC decided to approach the local Maasai leaders to jointly find a sustainable long-term solution for the conservation of the area. After many consultations, held under the shade of acacia trees, 750 Maasai landowners decided to lease their land to the Mara North Conservancy, which was officially established on the 1st of January 2009. This new partnership established a truly innovative approach, whereby the MNC member camps guaranteed to pay fixed monthly lease payments to the Maasai landowners, regardless of tourism ebbs and flows, for the privilege of carrying out their game drives within this exclusive wildlife area. MNC is currently in the process of setting up a Trust Fund and the necessary infrastructure to initiate new community programs. These are developed after wide consultations with community members and implemented in equal partnership with the Maasai Land Owner Committee, which represents the entire community. Community Projects are also designed to be environmentally friendly and sustainable, and to ensure that the communities living in and around the conservancy benefit directly and immediately from MNC’s presence. MNC has raised funds from a number of organizations and foundations, including Anne Kent Taylor, The African Conservation Centre and The Obel Family Foundation. 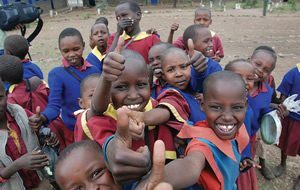 In April 2011, MNC was awarded US$ 1M by the Obel Family Foundation to execute the Bright Green Project (focusing on children’s education, conservation awareness, IT literacy, wildlife research and a community waste management system) over a 3 year period. 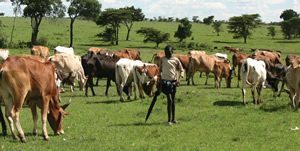 As cattle are at the centre of their culture and social life, the great advantage of MNC to the Maasai is that they can continue grazing their cattle under a management plan which ensures the simultaneous protection of the natural wildlife habitat. However, this inevitably leads to human-wildlife conflict as predators frequently prey on livestock when in their enclosures (‘bomas’) at night. Traditional retaliation practices frequently follow, including predator killings. Since 2010, in conjunction with the Anne Kent Taylor Fund, the Boma Fortification Project has been ongoing to address this problem of wildlife predation, offering chain-link wire fencing to improve defences against livestock predation. There is a long list of community members waiting to buy 18m long rolls of chain link wire which MNC is offering on a ‘buy-one, get-one-free’ basis. Already there are 130 fortified bomas on MNC under this scheme. See a report on the efficacy of these fortified ‘bomas’ here. For KES 4,000 you can donate the ‘free’ roll of chain link so that more pastoralists can protect their livestock. As a result, your donation will also contribute to the conservation of lions and other wild predators in the conservancy. At present MNC is establishing livestock and grazing management programs, with plans to improve market access for local herders. In 2010 MNC helped to develop educational facilities and programs that include environmental awareness, ecosystem health, as well as the training of teachers and provision of tables, textbooks, and free IT courses for the youth. The program was called Bright Green and funded by the Obel Family Foundation. The Bright Green project also included the development of a community-based waste management system in Aitong, a settlement on MNC’s Eastern border. In the future, MNC will continue to increase fund-raising activities, as well as corporate investments, in order to develop additional community projects that support the empowerment of the local community – particularly the youth and women.